Volkswagen recently released a commercial in a Hong Kong movie theatre that was a little out there, as far as car commercials go. It took place from the point of view of the driver, riding along a small road lined with trees. 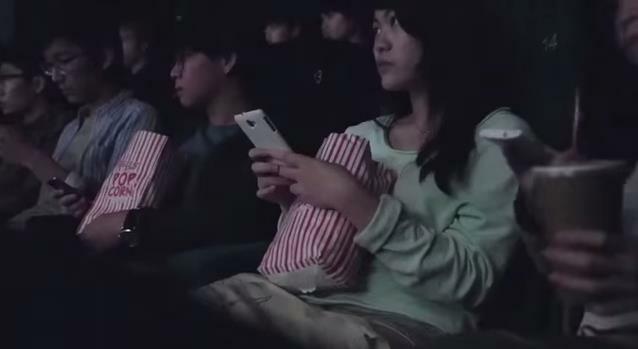 Meanwhile, everyone in the theatre simultaneously received a text. They all immediately reached for their phones to read the message, but as soon as they did, the car on the screen swerved into a tree, totally wrecking the windshield. Anyone who sees this commercial will undoubtedly rethink picking up their phone while driving. We can only hope that no one ever has to experience a real-life version of what played out on the theatre’s screen, so it was probably the best way to get people to acknowledge the possibility that it could happen to them. I’d consider an ad like this to be on par with one of those terrifyingly realistic smoking ads that have recently been occupying our TV screens and radio speakers. Can this really be called a Volkswagen advertisement, though? Sure, the iconic VW logo and “Das Auto” flashed briefly on the screen at the end of the commercial, but there was nothing in the clip the specifically promoted Volkswagen. Plus, scaring people isn’t always the best way to get them to buy from you. Volkswagen didn’t need to air this ad—presumably, they did it to ensure the safety of drivers everywhere, VW owners and other brand owners alike. To see video of this commercial, click here.